Chrissie Hynde has revealed one of her biggest hits was inspired by an airline announcement. 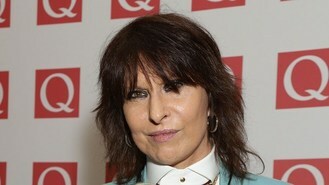 The Pretenders star, who had a top 10 hit in 1986 with Don't Get Me Wrong, said she got the idea for the tune while she was on a plane. Speaking at the Q Awards in London where she won the Classic Songwriter award, she said: "I think it was British Air. 'Dong, dong, dong, dong - Welcome to British Air'. I think that's where I caught that one". Chrissie, who said she bought a copy of Morrissey's memoirs "the day it came out", said she had not "really thought" about writing her own memoirs. American-born Chrissie, who like Morrissey is a prominent vegetarian and animal rights campaigner, formed The Pretenders in London in the 1970s and has racked up more than 10 Top 40 hits in her three-decade long career. Lady Gaga and a former personal assistant who sued her won't face off in a trial next month after settling their differences out of court. Pete Tong has admitted he wishes he had signed Calvin Harris. Jake Bugg says he has not listened to The Voice winner Andrea Begley's cover version of his song Lightning Bolt. A gospel choir greeted a likeness of the late Whitney Houston as it arrived at Madame Tussauds. Robbie Williams was declared a pop idol at the Q Awards with other winners including Ellie Goulding, Pet Shop Boys and Jake Bugg. Dolly Parton has playfully poked fun at Miley Cyrus during a performance on a US TV show. Max George has poured his feelings out about his split from Michelle Keegan into some of The Wanted's new music. Keane have announced plans to split up.